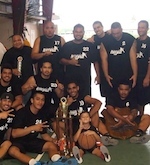 The American Samoa basketball association has kicked off it's 2015 Moso'oi basketball tournament on September 19th at the St. John Paul II gym in Malaeloa. In this year's tournament ASBA has been truly fortunate to have GHC Reid and company Vaimalu & Powerade and the American Samoa Visitor's Bureau as the major sponsor for this year's tournament. 'We're very blessed that GHC Reid & Company and American Samoa Visitor's Bureau answered our request with open arms. These companies are very well known in the community for supporting local functions and for being such great role models in our community' commented by ASBA President, Milton Taufa'asau. GHC Reid and company & American Samoa Visitor's Bureau were present at the opening of the tournament and were visible to the large crowd in attendance. Theresa Siataga from GHC Reid was there with her team in providing Vaimalu purified water and powerade during the competitions and also Deputy director Vaito'a Hans Langkilde was also in attendance representing the American samoa visitor's bureau. ASBA President was beaming with pride to see these companies making a huge impact in our tournament and allowing the association have this tournament. The tournament is made of two junior teams, 14 men's team and 5 women's team. The men's team are separated in two pools for their competition while the women's division will be a round robin format. After the soft opening which was led by prayer offered by ASBA Secretary-Treasurer & tournament coordinator, Paulo Pua'auli, and welcoming remarks by ASBA Vice president, Diehl Langkilde, the tournament quickly got underway with the introduction of the Junior division that had two competitions leading with Aua Rainmakers I versus the Tafuna Thunders. The junior division consists of players age range of 12 - 15 year olds. The Tafuna Thunders won both matchups against the tough Aua Rainmakers. The women division was up next that saw a friendly matchup between Aua versus Faga'alu Starz that was an intense game, but had the Starz come out in the last minute for the win. In the next women's game was a friendly matchup between the Aua team against Pago girls, led by coach Zero Iaulualo. It was a good game for the two teams, but saw too much of an advantage by the Aua team as they capitalized on turnovers and fast breaks led by Kadrenna Velega, a silver medalist from the women's national team that competed in Papua new guinea. The biggest surprise saw a young lady who is a 6th grader at 11 years old playing for the Aua women's team, Chamera Pereira. She showed great poise and played exceptionally well against the more seasoned ladies in the tournament. We'll be seeing a lot more of Chamera as the tournament progresses. In the men's division saw the return of the Aua men's basketball team led by Fagaloa basketball president, Michael Pereira. 'It's an exciting time for ASBA to have a Fagaloa return into competition and turnout of athletes from Aua is tremendous to see. We're very supportive of the Fagaloa basketball development group and hope to see more teams come out from that area' said Vice President of ASBA Diehl Langkilde. Air Ballers and Aua I were the first team on the ticket to start off the men's competition. It was a back and forth battle between the two teams, however fouls, costly turnovers by the Aua team and Raynor Whitcombe 20 point performance was a key factor for the Air Ballers win. In the second men's game had the young Aua II team going up against a new team from Iliili, Samurai. It was an exciting game that saw a young, but raw talent of both teams go up against each other. All four quarters was a trade of baskets going in each direction. However, the zealous Aua II team made a final push to grab the win against Samurai. In the final game of the day had two new teams join the tournament, Fatuoaiga Saints & Dawn Breakers. Led by a seasonal veteran coach who comes from a tradition of championships in the Fagaloa basketball league and ASHSAA high school basketball during his tenure at Samoana high school, Dave Lemisio. His style of coaching and philosophy was put into effect with this core of players of Fatuoaiga to go up against an untested Dawn Breakers team. It was a good test for both teams as they try to build chemistry and executing their offense, however saw a Fatuoaiga team that overpowered a young Dawn Breakers led by forward Charlie Kava. The Dawn Breakers were in high spirits regardless of the loss as they head back to the drawing boards to prepare for their next matchup. The American Samoa Basketball Association is very fortunate to have been able to use the Tafuna high school gym under the supervision of Principal Beauty Tuiasosopo, who is a huge supporter of youth development in sports and of ASBA. Principal Tish Peau of South Pacific Academy for allowing ASBA it's basketball clinics on the weekend and Father Vaiula Iulio with usage of the St. John Paull II gym in Malaeloa. 'It's with these great individuals that we're able to work with to use the facilities to promote our sport and conduct competitions that we are truly appreciative for generosity and kindness. Words can't express our gratitude. We also can't say enough for our major sponsors of GHC Reid and company of Vaimalu & Powerade and President, Mrs. Olivia Reid-Gillet and also the American Samoa Visitor's Bureau and their director, Mr. David Vaeafe for their great & tremendous support for the 2015 Moso'oi basketball tournament. You're generosity is great appreciated by ASBA and all of our basketball families' commented by Taufa'asau.